A view from a hot-air balloon of Mount Snow, Vermont, in the fall. With the days becoming shorter and the nights cooler, it can only mean that fall is approaching and along with it comes the breathtaking colors of fall foliage in the Green Mountains of southern Vermont; a phenomenon of nature that annually attracts thousands of leaf peepers to the area. Now those leaf peepers can enjoy an extended stay at a Mount Snow lodging property for less with the resort’s new Fall Foliage Special offering three nights for the price of two during the peak foliage timeframe. Mount Snow is the southern-most mountain resort in the State of Vermont making it easily accessible for folks living in and around the northeast’s bustling metro areas. The Mount Snow Valley is home to an abundance of dining options, shopping, events and festivals which make it a top destination for guests looking to enjoy a fall getaway. 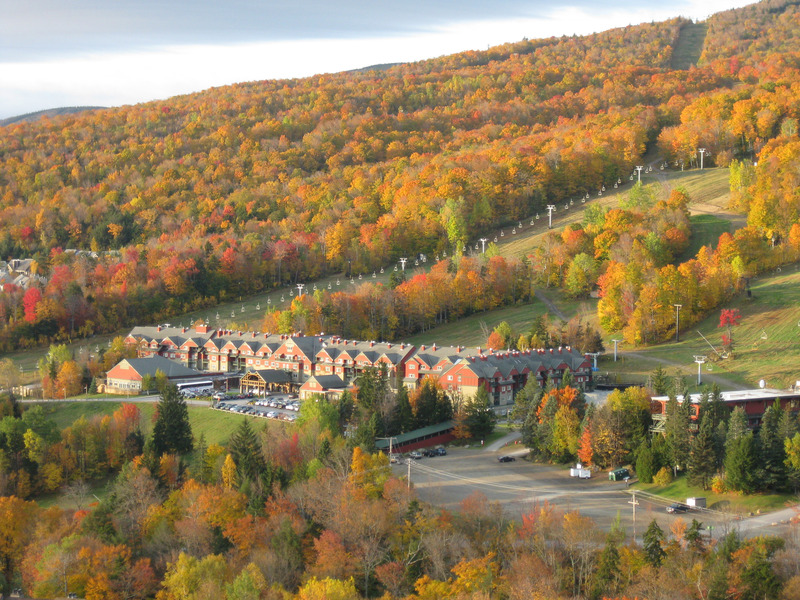 The Fall Foliage Special is available to stay the nights of September 23 – 27 and then September 30 – October 5 at the Grand Summit Resort Hotel or a Mount Snow Condominium. Guests booking their stay for the week of October 1 can include a complimentary scenic chairlift ride to the summit of Mount Snow in their package. The Bluebird Express chairlift will be running daily from September 29 thru October 8 from 10am to 4pm for scenic rides. To book a Fall Foliage Special or discover more about Mount Snow visit www.mountsnow.com or call 800.245.SNOW.